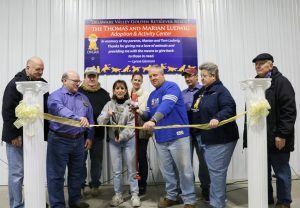 After years in the planning, we officially cut the ribbon and opened The Thomas and Marian Ludwig Adoption & Activity Center in January 2017. Thanks to the generous support of our DVGRR family, we are no longer weather-dependent for our monthly Meet & Greets as well as other on-site events. 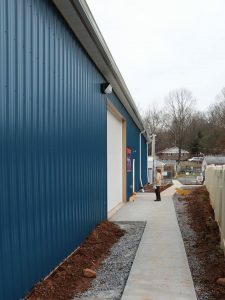 Why did we determine we needed this facility? Snow and ice sometimes prevented us from exercising dogs. Adoption appointments were cancelled as well as Meet & Greet events, so dogs spent more time waiting for their forever homes. Twice daily, 7-days-a-week dog walking was cancelled, limiting dogs’ exercise and additional socialization. Outdoor playtime – critical for dogs’ well-being as well as staff assessments – was limited… and delayed our ability to match the right dog to the right home. Where dogs can safely run and play… and get the exercise they need regardless of the weather. Where we can hold adoption meetings, so families and dogs can always interact without space restriction. That allows us to avoid Meet & Greet cancellations because of weather that might keep great adopters away… or because we’re concerned about canine and human safety. Where our volunteers can safely walk and play with dogs after dark. Hold fundraising events and avoid paying for an outside venue… more money for the dogs. Conduct dog training in a controlled environment. Have needed space in case of a kennel emergency or to provide an area for potential multi-dog intakes. Expand our outreach to the local community and surrounding area. Even provide a safe harbor for local dogs in the event of an area-wide emergency. Grow the number of educational events we offer to make an impact on the breeding farms in Lancaster County. Provide climate controlled storage, so materials would never be damaged or ruined… wasting precious dollars. Become self-sufficient, allowing more of the funds we raise to be funneled to where they’re needed most: with the dogs. 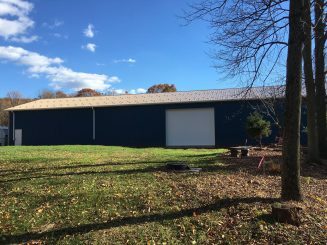 This building, The Thomas and Marian Ludwig Adoption & Activity Center, answers all of those needs… and visions. This building allows us to boost the care we provide to the next level. 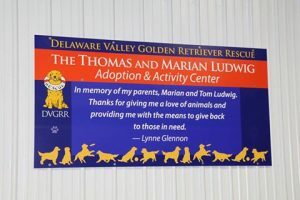 Watch our presentation from this year’s “Lucky Dog” Golden Gala and THANK YOU for all you do for the DVGRR Dogs!!! !